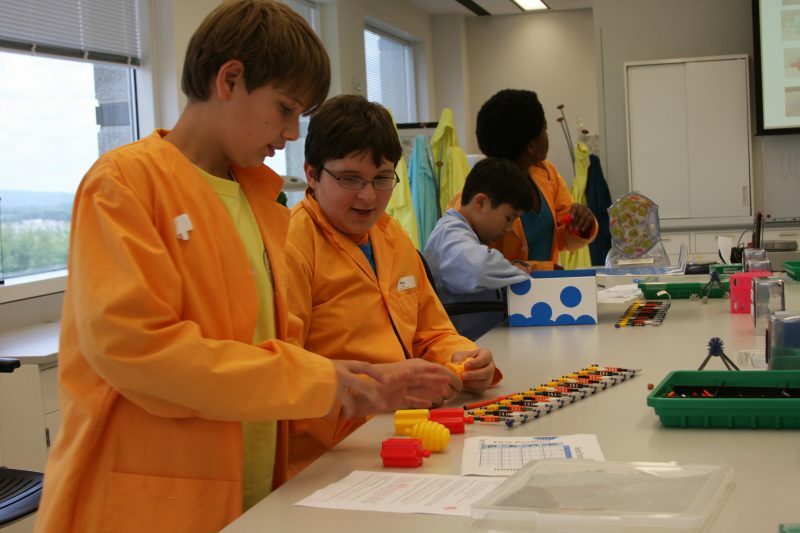 The HudsonAlpha Educational Outreach team provides several weeks of summer Biotechnology Camps for middle school students. These half-day camps are available to rising 6th through rising 9th grade students. Three different camp options are offered — all housed within the educational spaces at HudsonAlpha. Information about each camp, as well as dates and registration information, can be found below. Registration for 2019 middle school camps will open February 19 at 9:00 am CST! The Code of Life camp focuses on DNA. Young scientists begin the week by extracting DNA from a variety of organisms and end the week with a little genetic engineering. Campers learn how the information coded in DNA controls physical traits and investigate how changes in DNA may cause the symptoms of some genetic disorders. Students tour the HudsonAlpha facilities and meet with our educators and researchers. The Code of Life Campers also investigate the many roles of enzymes in living systems. Throughout the camp, students use the equipment found in most science research labs and gain hands-on experience in micropipetting and centrifuging. The culminating experiment has campers creating glow-in-the-dark bacteria. Students who complete the Code of Life Camp are eligible for one of two advanced biotechnology camps: The Secret Lab and/or I Want to Work in a Lab Coat. In this weeklong advanced camp (formerly known as UDSO Challenge), young scientists will work together to learn and apply basic molecular biology techniques to design a bio-indicator to detect pollution in the river of a peaceful fictitious land. Students will build on the experience acquired in basic camp using biotechnology tools and equipment to take their explorations to the next level. Entering a secret lab, participants use a notebook left behind by a previous researcher to diagnose a water-born illness. They are tasked with using biotechnology tools to build a system that can let the townspeople know when the water is safe to drink. Have you ever wondered what it would be like to work in a biotechnology laboratory? Spend a week investigating the tools, techniques and science behind modern biotech careers in this advanced camp that builds on our basic camp skills. You’ll perform student-driven experiments and maintain a lab notebook of your discoveries. You’ll also get a behind the scenes look at one of Alabama’s fastest growing career fields with tours of our high tech lab spaces.